Cancer survivors set out around the track for the survivors' lap in the 2011 Relay For Life of Moffat County. This year's event will commence at 6 p.m. Friday at the Moffat County Fairgrounds. 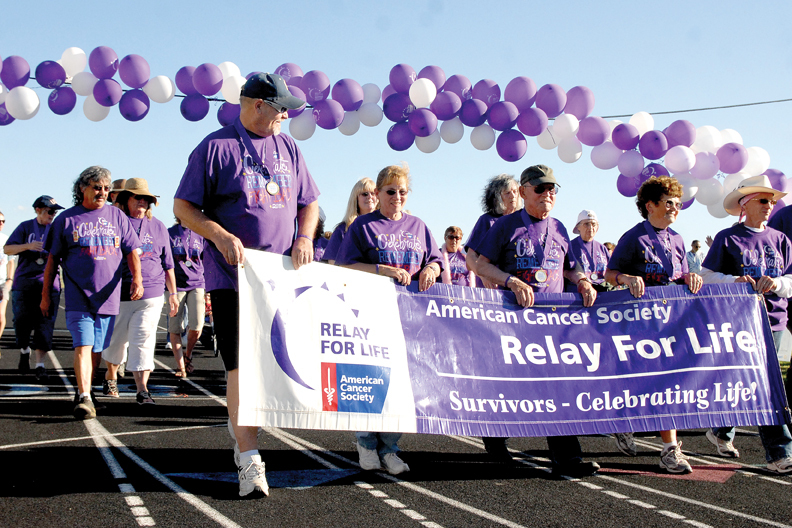 Craig — The 2014 Relay For Life of Moffat County will take place at 6 p.m. Friday at the Moffat County Fairgrounds. The annual event is an effort to raise funds and awareness about cancer, with all proceeds going to the American Cancer Society. More than 4 million people in over 20 countries participate in the event each year, according to the Relay For Life website. The event will last approximately four hours, beginning with the opening ceremony at 6 p.m, followed by the survivors lap at 6:15 p.m. for those that have triumphed against the disease. Survivors will be joined on the second lap by caregivers and community members as a show of solidarity, kicking off the relay. About 25 participants are registered for the event, with many more expected to drop in Friday. Event organizer Emily Hines said she has spoken with many community members who are planning to attend even though they have not pre-registered. In the past, the relay has consisted of individuals and relay teams of eight to 10 participants walking laps around a track starting in the early evening and continuing throughout the night until the next morning. Teams host fundraising activities such as bake sales and car washes to raise money before the event. The local branch of Relay For Life, which began in 2007, raised more than $67,000 its first year and $107,000 in 2008 with nearly 500 participants. Participation has decreased in recent years, with the 2013 event bringing in $8,500. The event has been shortened this year to encourage people to attend. While there are at least five teams signed up for this year’s event, Hines stressed that all are welcome to join, including individuals. She also noted that organizers would be flexible regarding the $10 registration fee and that smaller donations would be accepted. Hayden resident Lynn Simmons has been participating in Relay For Life in Steamboat Springs and Craig for three years, along with her husband, Dave Simmons, and 12-year-old son, Garrett Salazar. Together, the three comprise the team “Keep On Truckin,” in tribute to her father, a truck driver, who died of pancreatic cancer. This year, Garrett participated in the Steamboat Springs Relay For Life with a broken leg, completing 10 miles around the track in the middle of the night on his crutches. “His arm muscles were sore,” Simmons said. This year’s Relay For Life of Moffat County will feature snacks and pizza, music and mini-contests to keep people motivated as they walk. The event will wind down with the luminaria ceremony at 9 p.m. to honor those whose lives have been lost to cancer, and a closing ceremony at 10 p.m.
Those looking for alternative ways to support the event can make a donation online or at the event, or can purchase a luminaria — a paper bag containing a votive candle — to dedicate to a loved one. Registration will open at 5 p.m Friday. For more information, to register or to make a donation, visit http://www.relayforlife.org/craigco.